Reese Lansangan finds inspiration by exploring unfamiliar places in the Philippines and beyond. Indie artist and internet sensation Reese Lansangan has won the hearts of young musicians and music lovers with her own brand of quirky pop and her lilting, catchy melodies. Her songs, which touch on everything from budding romances to failed relationships to poor grammar, resonate with thousands of young Filipino millennials who find encouragement and inspiration in the singer-songwriter’s thoughtful lyrics. The award-winning artist tells us how traveling, be it on a spontaneous road trip or in an unfamiliar country, has helped open her mind, her heart, and her horizons. Experiencing a different environment refreshes Reese’s mind and allows her to explore new ideas and inspirations. Traveling, seeing new things, and meeting new people open Reese up to a world of possibilities. Reese is inspired by her fans and their personal stories. The spontaneity attached to road trips allows Reese to indulge her whims. Recently, Reese went for a drive in Antipolo where she met up with music coach Toto Sorioso, who was her guide and mentor in writing the Tagalog songs she hopes to include in her next album. As a true millennial artist, Reese was an easy choice to represent her generation as the face of Ford Philippines’ Creative BLK campaign. The Creative BLK (“creative block”) campaign seeks to take creative millennials to where they’ll be more in-sync with their passions, through a series of videos that showcases how the Ford EcoSport can take millennials to their own Creative BLK—a place where they can be inspired to pursue and live their creative passions and interests. Creative BLK will feature Filipino millennials who are making waves in music, culinary arts, and photography. The Ford EcoSport attracts a younger audience with its sporty looks. Reese enjoys the EcoSport’s real-world features and capabilities that are perfect for urban driving: smart keyless entry with push-to-start button, as well as the retractable sunroof that gives her a better appreciation of the fresh air, the sunshine, and clear skies—all of which inspire her during her drives. She also ensures a safe drive all the time with Ford’s SYNC connectivity system with Bluetooth and voice control, which means she can keep her eyes on the road and hands on the wheel, even while on the phone or listening to music. Reese also takes advantage of the EcoSport’s spacious trunk, which offers plenty of space to store her musical instruments. Curious to know what happened during Reese’s road trip? Watch the video below. 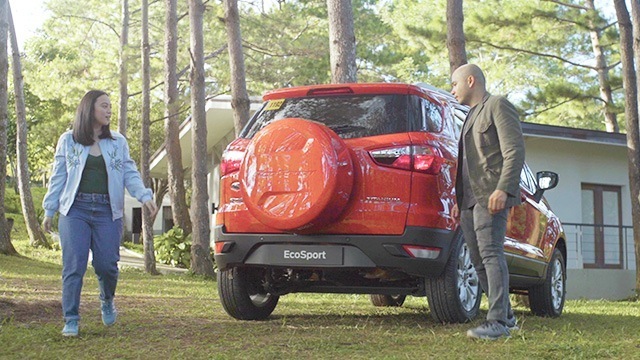 To know more about how the Ford EcoSport can take you places, check out this page. This article was created by Summit Storylabs in partnership with Ford.